The body is intended to be a self-regulating, self-healing organism. But for that to occur, the spine, which protects the nervous system, needs to be healthy. If the spine is not healthy – if it has shifted out of alignment or can’t move properly – it causes “interference” in the nervous system. And since the nervous system is the body’s master control system, this interference leads to ill-health and dysfunction. Knowing that some practice members have a preference for the type of adjustment they receive, at South Trail Chiropractic, Dr. Jeff provides both instrument and no-instrument (manual) adjustments. All adjustments are gentle and pain-free. Dr. Jeff puts practice members at ease through communication and education, letting them know what to expect every step of the way. He will never perform an adjustment until the practice member is 100 percent comfortable with proceeding. Come on in and get checked. Through our examination and education process, we will know by your second visit if chiropractic is right for you. For babies and children, the upfront spinal examination focuses on motion and alignment, and X-rays are avoided unless absolutely necessary. Dr. Jeff checks the spine health of babies and children by using his fingertips and applying very gentle pressure. There is no thrust, and no popping noises to alarm the young ones (or their parents). Using this technique, Dr. Jeff checked the health of his own sons’ spines when they were less than thirty minutes old. The youngest practice members are checked while sitting in their mom or dad’s lap, or while lying on a special pillow. If it increases their comfort level, they are swaddled in blankets. 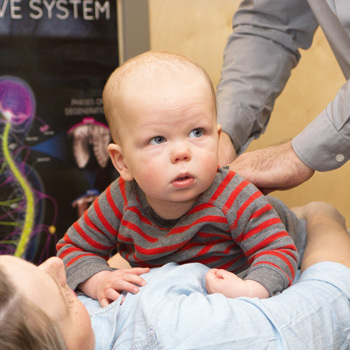 Parents sometimes wonder if their child is too young for chiropractic care. 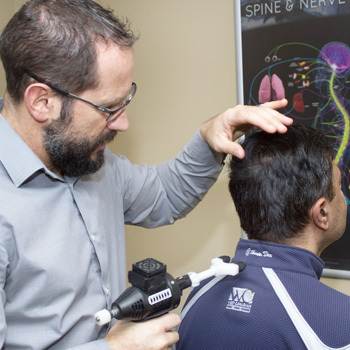 Dr. Jeff responds that anyone with a spine – no matter their age – can benefit from the elimination of tension in the nervous system. Any plan for continuing care and ongoing adjustments is based on the spine health of the individual child. We use the adjustment technique best suited for the individual practice member and their personal preferences. Book an appointment today!